Over the past 10 years, LuxConnect has built 4 data centers and has a total net IT space of 14,700 m². All these data centers are powered exclusively by green energy from hydroelectric dams in Norway. As a data center is a big energy consumer, LuxConnect engineers are very concerned about the impact on the environment and are constantly on the lookout for new technologies to make the best use of energy. Chillers using air instead of water, LED lighting in the data centers and rooftop solar panels are only some examples of LuxConnect’s concern to preserve the environment. One of the most significant examples is the cooling of one of the data center using excess heat generated by burning wood waste. Kiowatt, the result of the union of Luxenergie and Groupe François, has been active since October 2013 in the production and the distribution of energy from installations using biomass as well as in the production of pellets. At the DC2 data center located in Bissen/Roost, this continuous optimization process has led to an innovative energy concept that allows the production of cold based on the heat generated in the Kiowatt trigeneration site. The cogeneration plant is at the heart of the installation because, using wood waste, it simultaneously produces head and electrical energy. The electricity generated is injected into the public network and covers the needs of 6,000 households. The heat generated by the steam turbine normally released into the atmosphere is used for several purposes. 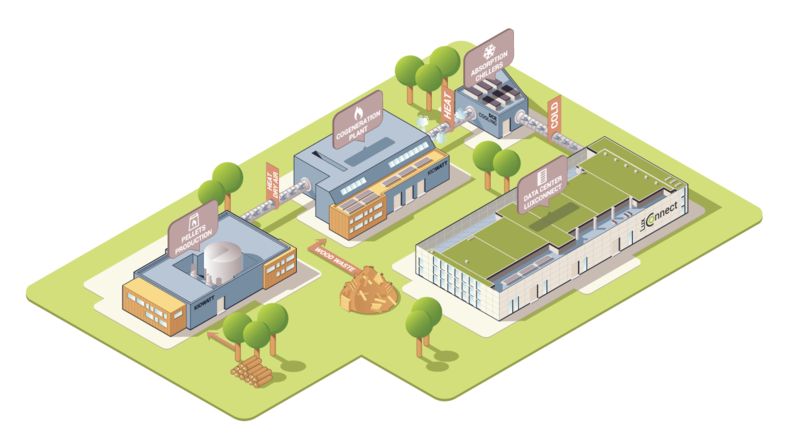 30% of the produced heat is used by Kiowatt to dry the fresh wood used for the production of pellets. Every year 35,000 tons are produced, which is equivalent to the consumption of 7,500 households i.e., 1,000,000 liters of fuel. 5% of the heat will be used to power the future heat network of the artisanal and business zone Klengbousbierg. 65% of the heat generated by the cogeneration plant is used to cool the data center located on the other side of the road. Indeed, 2 absorption refrigeration machines are powered by the rest of the superheated water from the cogeneration plant. The cold water is then transported via an underground network to the data center. The use of this heat produced by wood waste makes it possible to qualify this data center as the world’s leading green data center leading to a reduction of CO2 emissions of about 27,000 tons per year in Luxembourg. Discover more about LuxConnect DC 2 here!